Madera River. We join Rick Schair of Wet-A-Line Tours aboard the yacht Santana for the adventure of a lifetime. This early season exploratory trip revealed never before fished areas that were loaded with Peacock Bass. Rick demonstrates the proper way to work lures in order to entice the true trophy size fish. Madera River. We join Rick Schair of Wet-A-Line Tours aboard the yacht Santana for the adventure of a lifetime. We will tour the yacht to show you the unmatched luxury it provides. This early season exploratory trip revealed never before fished areas that were loaded with Peacock Bass. 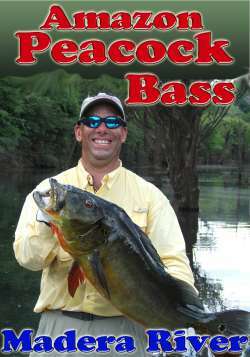 Rick demonstrates the proper way to work lures in order to entice the true trophy size fish. He even discloses the lures that reliably produce fish over 20 pounds each trip. Wouldn’t you know it? Rick no sooner explains how to catch the really big Peacocks when an explosion occurs, a battle ensues, and in the end, and he lands a fish that barely misses the World Record. We even land some other impressive fish of other species during the trip. So sit back and relax and take in the wonder of Amazonia.